The photo-sharing site Flickr is extremely popular. Those of us who have gotten the “Flickr bug” know it can become an addiction—I am convinced my wife may need some 12-step program to get over it. So, if you are looking to beat the Flickr bug, read no more; if you are looking to feed your hunger for Flickr, read on, dear addict. 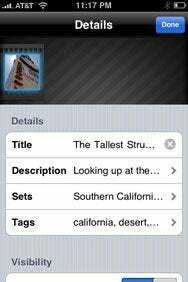 Flickr Friend: With Flickit, it’s simple to enter a title, description, tags, and other key details about the images you’re uploading to Flickr from your iPhone or iPod touch. Flickit by Green Volcano Software may be one of a multitude of Flickr-friendly apps available at the App Store, but it’s a fixture on my iPhone. Uploading your pictures to Flickr should be simple, and Flickit is the first uploader I have found that does it right. The interface is simple. Just tap large Camera or Library icons to take a picture (if you’re using an iPhone) or add a photo to upload. Get your photo, and you return to the start page, where you tap the photo to add desired details. As any good Flickr junkie will tell you, it’s all about the little things. You can add most of the important details about your image from within the app in an easier format than many desktop Flickr uploaders. Type in a title, description, add it to your sets, and tag it. The smooth interface lets you type in a title and a description; from there, choose from your own sets and tags. Flickit does have one weakness, and it rears its head here—you can’t add your photo to groups, something that will hopefully be remedied in a future release. Still, you’re able to set your geolocation with the iPhone, make your visibility public or private, and you’re done. Hit the big Upload button under the picture, and off to Flickr bliss it goes. Over Wi-Fi and 3G, the upload process is fast. If you want nothing to do with Flickr, so be it; you can avoid the “ooh-look-at-the-pretty-pictures” trance it puts you in. But if you are a Flickr junkie like me, Flickit is the at the head of the uploader class. Flickit is compatible with any iPhone or iPod touch running the iPhone 2.2 software update.